Location: On the south side of Parliament Street, Liverpool. Present state: Some station buildings and the platforms are extant. 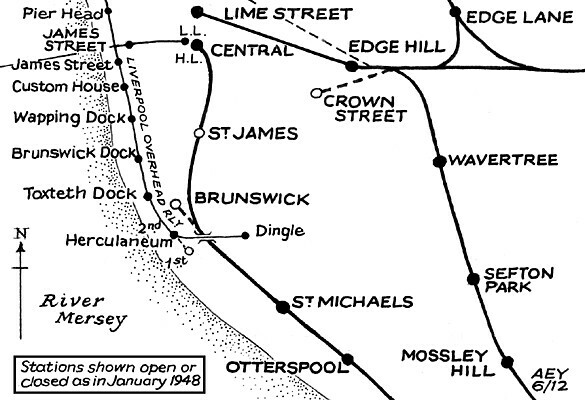 Notes: St James station was close to the centre of Liverpool on the Cheshire Lines Committee’s (CLC) main line between the northern cities of Liverpool and Manchester. The CLC was a joint company made up of three partners: the Great Northern Railway (GNR), the Manchester, Sheffield & Lincolnshire Railway (MS&LR) and the Midland Railway (MR). The CLC’s Liverpool and Manchester line had opened as a through route between Cornbrook East Junction (Manchester) and Cressington Junction (Garston) on 2 September 1873. The line linked with the former Garston & Liverpool Railway at Cressington. The Garston & Liverpool had opened from Garston to a terminus at Liverpool Brunswick on 1 June 1864. It was a joint railway of the GNR and MS&LR which became part of the CLC on 5 July 1865. At the eastern end of the line at Manchester there was a connection with the Manchester South Junction & Altrincham Railway (MSJ&AR) that allowed trains to run to Manchester London Road. Liverpool Brunswick, over a mile south of the centre of Liverpool, was inconveniently situated. Just over a month after it opened an Act was obtained by the partners on 29 July 1864 to build the ‘Liverpool Central Stn Railway’. The line was one mile and forty-three chains in length, and to reach central Liverpool it needed five tunnels and sections of very deep cuttings. There were two stations on the line: St James and what became the western terminus, Liverpool Central. 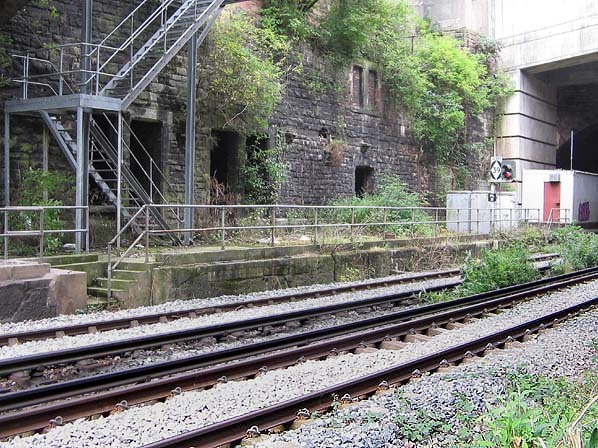 Due to the heavy engineering works the new line, including St James, did not open until 2 March 1874. St James Station was located in a cavernous deep cutting 62 chains south of Liverpool Central Station. It had an imposing sandstone building at street level on the south side of Parliament Street, west of the line. The single-storey building had four arched windows and, at its western end, an arched entrance doorway. The building contained a booking office and circulating area. To the rear was a waiting room. Steps led down to a lower level passageway that gave access to a further set of steps down to the Liverpool Central direction (down) platform and to a footbridge that spanned the line; another set of steps led to the Manchester direction (up) platform. The steps were roofed. Although the station possessed two platforms there were three lines running through it. The middle line though was used only for the movement of locomotives and empty stock from the terminus station either to Brunswick shed or to sidings. 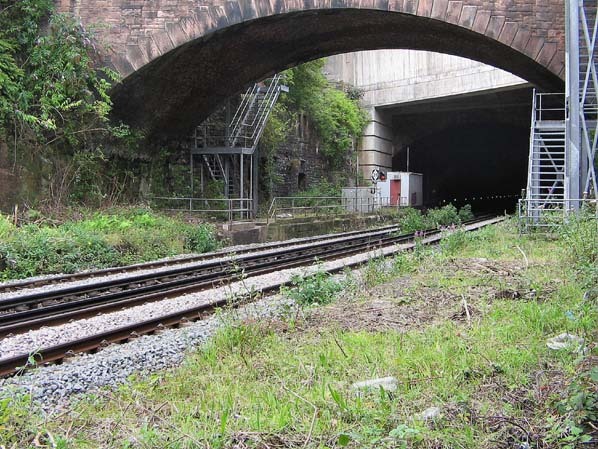 At the north end of the station the line entered the Great George Street Tunnel which carried it to Liverpool Central. South of the Station was St James Tunnel No. 1, followed in quick succession by Numbers 2, 3 and 4 after which the line emerged at Brunswick. Passing over the top of the station at roughly its midpoint was a bridge that carried Ashwell Street. At platform level the station had further rooms excavated into the red sandstone rock face. At the southern end of the ‘up’ platform was a 17-lever signal box. At the time of opening the station was served mostly by local stopping services which would have run to points along the main line. After December 1879 these services included the Walton-on-the-Hill train which ran via the newly completed CLC North Liverpool Extension Line. The December 1895 timetable showed Liverpool St James as having an intensive weekday train service as seen in the table below; it also had Sunday trains. On 1 July 1897 the MS&LR changed its name to the Great Central Railway (GCR). St James station was very close to the centre of Liverpool, and by the early 1900s it would have experienced strong competition from the newly electrified city tramways. On 15 October 1913 there was serious accident at St James station which resulted in seven deaths. A Board of Trade report by Lt – Col. E Druitt published on 13 December 1913 explained how the 2:30pm CLC Manchester Central express, consisting of GCR loco number 1016, five CLC coaches, one Great Eastern Railway (GER) coach and two GCR coaches, departed as usual from Liverpool Central. Before it reached St James station the driver Edward Howson felt the brakes go on, which he put down to a passenger having pulled the communication cord. Not wanting to stop in the tunnel he managed to get enough pressure to pull his train into St James station. According to Howson he stopped the train at St James at 2:35pm. Howson stepped off his locomotive leaving his fireman James Jones on the footplate. The signalman from St James signal box, Walter Pipprell, came out to see what had happened and Howson explained the situation to him. Pipprell returned to his box and signalled to Liverpool Central at 2:36pm that the train was standing at St James. The signal box at Liverpool Central was a very busy place, and on that afternoon it was in the charge of signalman William Thompson who had a train booker with him called Edward Shorleson. The duties of a train booker were simply to record in the log book all of the train movements, as the signalman would have been too busy to do it. According to Thompson it was usual practice at Liverpool Central for train bookers to also work the communication system (the block instruments) between boxes under the direction of the signalman, although the practice was against regulations. As soon as the 2:30pm Manchester train had left Thompson had an engine to signal into the station, and he set about doing so. He then saw Shorleston working the block instruments and thought he heard the bell signal that would have indicated that the 2:30pm train was out of his section. He then set the signals to allow the 2:35pm MR Derby service, which consisted of engine number 352 hauling four coaches, to depart. The 2:35pm departed on time and, as it was passing the signal box, Shorleston, who had sat down to look at a magazine, noticed it and asked Thompson, ‘where is Derby going?’. Thompson said, ‘he is right away’. Shorleston was surprised and told Thompson that the 2.30pm was still in section. Thompson was surprised and said, ‘I saw you at the block Instrument’, and Shorleston explained that he had been refusing an incoming train. Thompson realized what had happened and set the station starter signal to danger but it was too late: the 2:35pm Derby train had passed it. Back at St James driver Howson had walked down the platform to explain to the guard, Edward Lloyd, that the communication cord had been pulled. Lloyd started to check the five CLC coaches that were level with the platform and in daylight. He could find no evidence that the cord had been pulled in those coaches and asked Howson if the train could be drawn forward so that the rear coaches could be brought into the platform where they could be checked. The rear portion of the train contained the GER coach that was going to continue on from Manchester Central to Harwich and the two GCR coaches that were for Grimsby. In one of the GCR coaches was guard, C E Bishop, who was leaning out of the coach to see what was happening. Lloyd explained what had occurred and what his intentions were. Driver Howson asked his fireman to attempt to draw the train forward, but the brakes were fast and he could not. At the footplate of the Derby express were driver Stephen Millward and fireman James Barker. After leaving Central station they plunged into a smoke-filled tunnel and Millward was tasked with keeping an eye out for the signals. It was a struggle to see, but the fireman did spot that the St James distant signal was on and so they slowed, expecting to be stopped at St James. Just after 2:37pm the 2:35pm Derby train ran into the back of the 2:30pm Manchester express smashing the rear coaches. The MR engine fell over to the right and landed on its side on the middle line. Five passengers were killed instantly, as was guard Bishop. Another passenger would die a few weeks later from injuries sustained and a further 62 people were injured. Fireman Jones in his evidence stated that his locomotive was pushed forward fifteen yards and, realizing what had happened, he grabbed some red flags and detonators jumped down from the engine to run south into the tunnel and warn trains on the down line of the collision. He set his detonators, which were activated by a train which managed to stop before it reached the crash site. 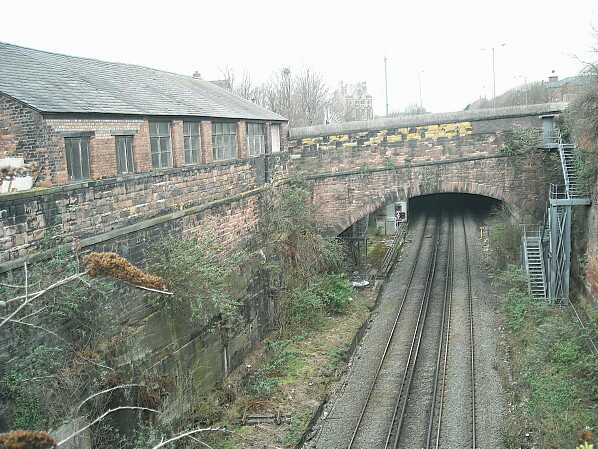 In his report Druitt concluded that the accident was caused by an unfortunate set of circumstances aggravated by the busyness of Liverpool Central station; the tunnel, which was notorious amongst loco crews for its bad visibility aggravated by smoke from locomotives; and also by the fact that signalman Thompson, a man with 34 years’ experience, was so used to working Liverpool Central that he had been acting almost automatically. Druitt stated that even though Thompson had made an error it would not have resulted in a crash had the Manchester express not been stopped through the activation of the communication cord. 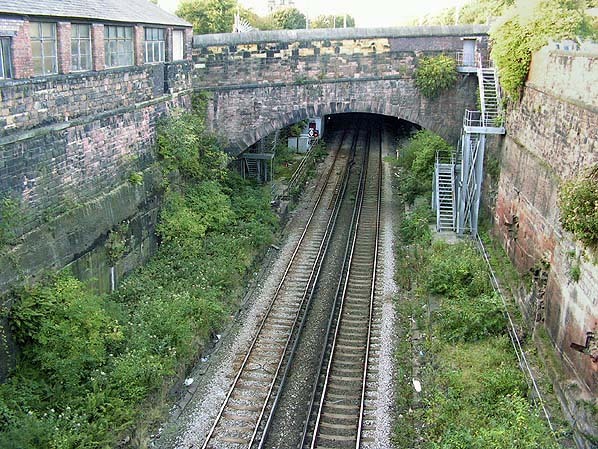 Druitt recommended that the track circuit at Liverpool Central be extended to a point beyond St James, and that when it showed a train in section the signals at Central would be locked, thereby stopping a train from departing until the tunnel was clear. Despite enjoying such an intensive service St James station closed on 1 January 1917, as did many others as a wartime economy measure. Unlike most of the others St James did not reopen when hostilities ceased. For many more years local and long distance trains thundered through its platforms until the line closed in April 1972. St James street-level building survived into the 1960s. The line through St James reopened as part of the Merseyrail Northern Line in January 1978 but St James station remained closed. Surprisingly much can still be seen of the station from the windows of passing trains despite it being closed for so long. At street level huge sandstone walls are all that there is to show that deep beneath the streets this is a railway location. 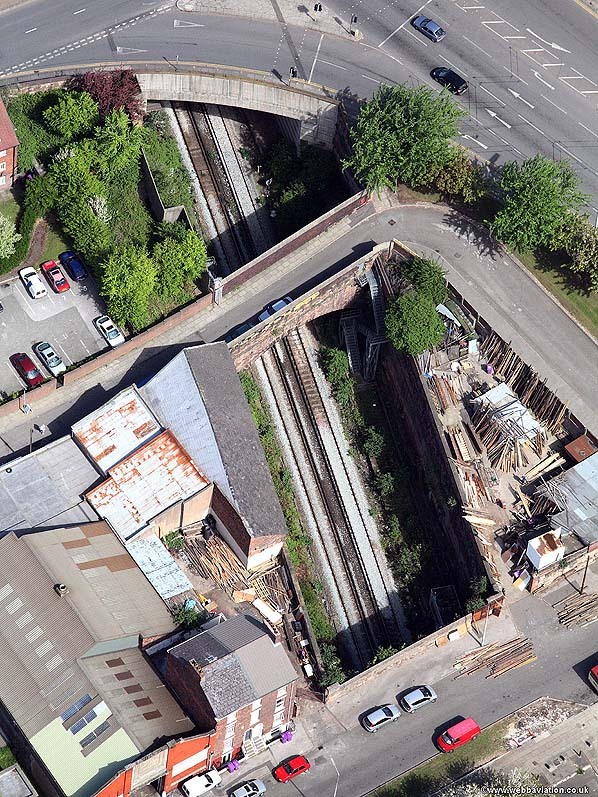 In 2014 it was announced that Merseytravel (the local transport authority) in partnership with Liverpool Vision (a development agency) would undertake a study into the viability of reopening St James station. The area had developed over the previous twenty years and it was felt that a station was required to serve it. For other stations on the Liverpool to Manchester CLC line click on the station name: Liverpool Central, Brunswick, Otterspool, Garston, Halewood & Manchester Central. 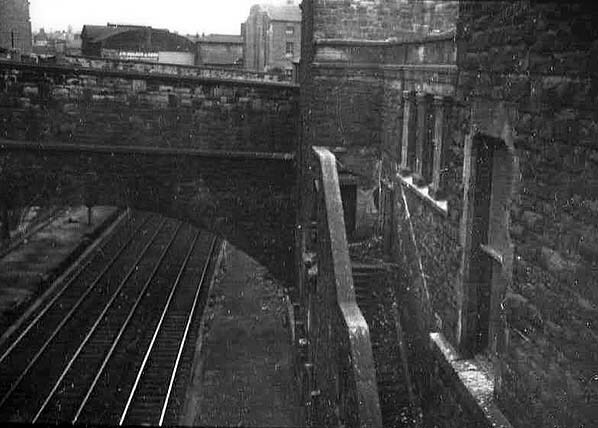 Looking south at the platforms from the street above in early 1960s. 1894 1:500 OS town plan. Looking north at the platforms from the street above in September 2005. Looking north along the up platform at Liverpool St. James station in July 2008. Looking north at Liverpool St James station on 13 March 2012.